If ever there were two SUV’s that you’d bring to the track, it’s these. The X5 has proven that it can kick up the dust with the best of them, but what happens on-track when compared with the ultimate SUV? As they say, there’s no rest for the wicked. And since the X5 proved itself to be surprisingly adept on the dirt, we decided to put it to the test on the tarmac as well – and properly, of course! This is the first time, in fact, that we’ve brought a couple of SUV’s to the track – or SAV (Sports Activity Vehicle) I should say in the case of the X5, before I get a rap on the knuckles from the folks at BMW. But the X5 isn’t alone, we’ve also brought along the Range Rover Sport to keep the Bavarian honest. The RR Sport, after all, is the best of the breed. It’s got a brand new all-aluminium monocoque chassis and some pretty nifty torque vectoring technology. Being a Land Rover, not only is it phenomenal off the road but on it as well. In fact, this is the very same car that took pride of place on the cover of our February issue this year – which involved a trip to the hills to hunt for some snow. 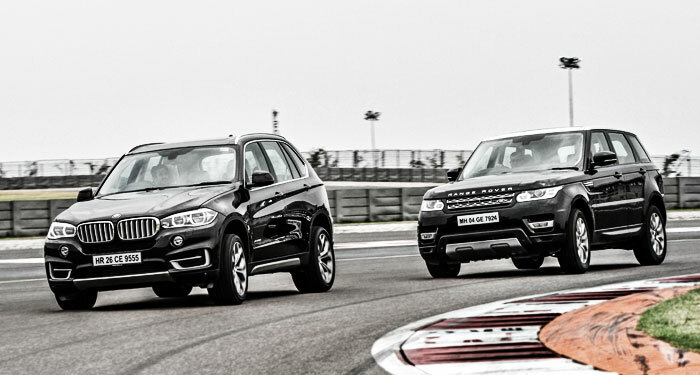 The RR Sport led the charge with three other crossovers that were more than happy to stay safely in its tracks. It was certainly the only one of the lot that was willing and able to attack sheer cliff faces caked in the white stuff. The Range Rover truly is exceptional off the road, and would leave the X5 for dead in the woods. And it’s no slouch on the tarmac either. But, here at the BIC, it could be an entirely different story. Yes, they both have 20-inch rims, but the BMW has 315/35’s at the back while the Sport has 255/55’s – so not only does it have less rubber meeting the road, but it also has more flex courtesy of its larger sidewalls. Moreover, to retain the ability to traverse the harshest terrain on the planet, it has higher ground clearance and more give in its pneumatic suspension. So, before setting off, I lowered the suspension as much as possible, put the gear lever in Manual, and gripped the steering with a hint of trepidation. I needn’t have – been worried that is! You see, my first taste of the new Range Rover Sport was at the Jaguar Land Rover test facility at Gaydon in the UK last year. It was a short drive, but one that made quite an impression all the same. On the test track not only did the Sport have tremendous grunt and grip – that was the 5.0 litre supercharged petrol variant on 21-inch rims – but it also handled brilliantly as well. My second experience was on the aforementioned expedition to hunt for some fresh snow. And, on both occasions, what really stood out was the torque vectoring technology. In the hills, it just seemed to catapult the RR Sport around bends at unfathomable speeds. It really was very impressive. There were times, in fact, when I would actually keep my foot on part throttle rather than getting off the accelerator completely because the torque vectoring would allow me to maintain a speed and line through a corner that would have been inconceivable otherwise. And it’s the same story on the track as well. It truly provides you the sense of pulling the outside wheels through the corner. It has the same effect in a Jaguar F-Type coupe as well for instance, but you notice the benefits far more in the Range Rover Sport because of its extra weight and mass. The other thing about the Range Rover is its beautiful interior. It’s truly a special place to be. The seats are not only supportive, but extremely comfortable as well. The blend of materials – which include wood trim, aluminium accents, and different shades of leather – is impeccable. Even when you’re pushing to ten-tenths, it feels a bit like you’re on a Sunday drive – simply because the cabin is so very comfortable. 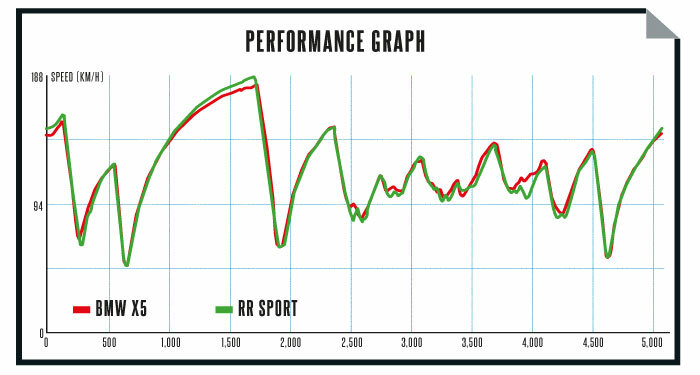 It’s also indicative of the leap in engineering that Land Rover has taken with the new RR Sport. The last generation, while impressive, was based on the ladder-frame chassis of the Discovery. The new Sport, thanks to its all- aluminium architecture, sheds 420 kilos compared to its predecessor. And you can really feel the benefit of that on the track. It also demonstrates just how versatile this SUV really is – it can go from the depths of the jungle to the start line at the track with no trouble at all. Things start unravelling, however, when you get into the cabin of the X5. Immediately, the BMW feels more business-like and ready to attack corners. Yes, the cabin feels more Spartan – it’s typical BMW fare, which means that the quality of materials and fit-and-finish are second to none, but it is more bare compared with the Range Rover. You do have to remind yourself that the X5 will be virtually half the price of the RR Sport though. You sit lower in the BMW, even though the seats don’t offer nearly as much support. The car also feels lighter and smaller. The suspension is much firmer, which is what you want on the track. Immediately, everything feels more urgent and precise. Both cars have a 3.0 litre turbo-diesel, mated to the same ZF 8-speed gearbox – which, we’ve said over-and-over again is the best gearbox in the business at the moment. The RR Sport is a little more powerful though, with 288bhp and 600Nm of torque, while the X5 produces 258bhp and 560Nm of torque. Both, however, accelerate too 100km/h in exactly the same time – 6.9 seconds. Because of the nature of the driving experience, the BMW just feels quicker, but it’s actually the Range Rover Sport that’s faster at the end of the back straight – clocking 187km/h versus 181km/h. Put that down to more power and possibly even less drag thanks to the smaller rubber. The Bavarian motor does sound sweeter though, and seems to rev more urgently. To test refinement, we checked sound levels with a decibel meter at a steady speed of 120km/h in 8th gear, and both machines were virtually identical at around 62 decibels. If you look at the telemetry chart, however, you’ll see that where the BMW pulls ahead is through the corners. While the RR has a better top end, the X5 simply pulls away through the long corners – especially the parabolica at turn 10. 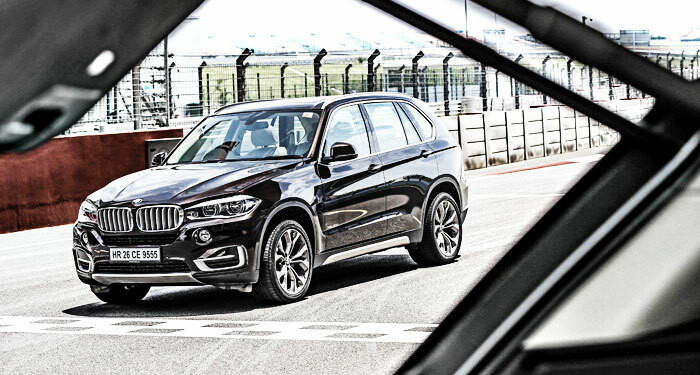 While the Range wants to understeer off the track, the BMW just grips and goes. There’s simply too much roll in the RR Sport with these wheels and tyres. Admittedly, they help with ride quality on the road, and no one in their right mind is ever going to take their Range Rover (or X5 for that matter) to the track. The intention of this test, then, is to test these machines in the most extreme environment possible, and the one thing they prove is that these SUV’s are far from being at sea on the track – and that’s hugely commendable for cars of this size and vehicle class. The BMW is certainly tuned to be far more aggressive on the road, and its Lamborghini-sized rear tyres provide huge gains on the track. It’s simply much sharper turning in, has far less roll, and allows you to carry far more speed through the corners. 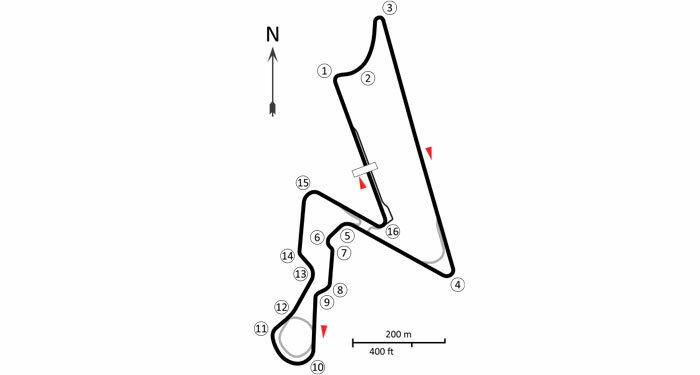 You feel much more connected to the track surface – with the exception of the feedback from the steering that is, which becomes a little vague and inconsistent mid-corner. I just wish the steering ratio was a little quicker and the calibration was more linear. But, steering feel apart, I can’t find fault with much in regards to the BMW’s dynamics on road or track. If I was in the market for an on-road SUV that could make the occasional trip on the dirt, I would pick the BMW among the many premium SUV’s simply because it drives so well most of the time – and it’s proven that it’s no slouch off road either. But if budget wasn’t a constraint, and I needed to conquer a dirt trail, while fording the odd river en route to my cabin in the woods, I would gladly take the RR Sport. My co-passengers certainly wouldn’t complain either! Both our (rather extreme) tests of the X5 have proven, though, that BMW has honed the ‘SAV’ recipe that it concocted in 1999 to absolute perfection.